Take the guesswork out of getting fit! 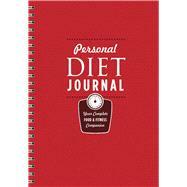 With the Personal Diet Journal, it's easy to track your progress and figure out what works best for you. It provides a wealth of information about diet and exercise, including a BMI Chart, Exercise Chart, and Fat and Calorie Food Chart. There's also a quick guide to foods rich in essential vitamins and minerals so you'll get the biggest bang for every bite you eat. Just jot down your daily stats in the journal, check your results on the weekly goal progress chart, adjust if you must—and you're on your way to becoming slimmer, stronger, and healthier!